"We will contribute to the growth of the national economy by securing future growth engines, which is an urgent priority of the group"
On May 17, the opening ceremony for CJ Blossom Park and the 2017 ONLYONE Conference were held at Gwanggyo, Suwon of Gyeonggi Province with as many as 300 people attending including Lee Jay-Hyun, chairman of the CJ Group and heads of the group’s affiliates such as Lee Chae-Wook, vice chairman and CEO of CJ Corporation and Kim Chul-Ha, CEO and vice chairman of CJ CheilJedang and employees of the Integrated R&D Center. 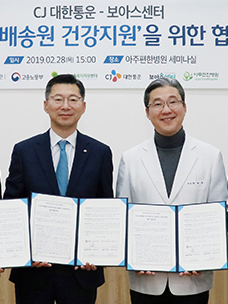 To start with, group chairman Lee Jay-Hyun, who attended the official event for the first time since the ONLYONE Conference in May 2013, said that he felt sorry for not having carried out more effective management undertakings and expressed sincere thanks to employees. - "I will put my unfinished business back on track," chairman Lee said. "Thanks to your love and care, I have been able to pull through the hard times and I stand here before you expressing my deepest gratitude," chairman Lee said. "At such a crucial time to make a breakthrough after the declaration of the group’s second take-off in 2010, our group was unable to secure a future growth engine and our global business became sluggish due to my absence from group management. I feel sad and a strong sense of responsibility. From this day forward, I will devote myself to management once again. I will secure a future growth engine, which is an urgent priority of the group, and put unfinished business back on track. I will spare no effort and support in pursuit of this objective. " Chairman Lee, who had focused on making a recovery since last year's special pardon, showed that he was healthy enough to issue greetings on a platform although he relied on a wheelchair and others’ assistance. The chairman, who had the longest period of absence among heads of major business groups after facing a crisis, while tirelessly working to changing the group from a food business-oriented one to a cultural business-oriented one, made clear his commitment to contribute to the nation through business. "Currently, as existing industries are beginning to wane and new growth engines are not being realized as of yet, CJ's contents, lifestyle service, logistics, food and bio business divisions will inject new vitality into the national economy. When CJ Group becomes a major world-class company on the global stage, I feel that the former chairman’s and my business philosophy of contributing to the nation via business will come true," chairman Lee said. Chairman Lee emphasized the realization of 'World-Best CJ' in 2030 that transcends 'Great CJ' in 2020. “We have to realize World-Best CJ through which CJ Group will become the world's best in three or more business sectors in 2030 and eventually become the world's best company in all business sectors after going beyond achieving Great CJ which aims to post 100 trillion won in sales in 2020," chairman Lee stressed. The CJ Group is planning to invest a total of 36 trillion won including five trillion won this year in M&A, in logistics, bio, cultural contents and so forth by 2020. 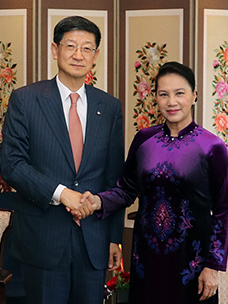 "Achieving the status of World-Best CJ is our natural calling and responsibility of the times that we are in and is something that CJ must fulfill and pave the way to contributing to the national economy," chairman Lee added, "Let’s further evolve CJ into something that people can be proud of and the world recognizes." CJ also emphasized the spirit of "contributing to the nation via business" in its management philosophy which was released to employees on that day. The management philosophy is to present CJ's mission, visions, core values and general rules of conduct. The business group adopted “contributing to the nation and society by creating the best value through ONLYONE products and services” as its mission, its highest value. Moreover, the CJ Group set its spirit of 'ONLYONE', 'win-win growth' and 'talent' as corporate core values and presented honesty, enthusiasm, creativity and respect as principles of actions to achieve them. The ‘ONLYONE Conference' is a group-level event that bestows prizes on employees who have attained high achievements in the past year. Since 2005, chairman Lee had hosted the event but the event has not been held since 2014. This year, the event was held along with the opening ceremony for CJ Blossom Park, CJ Cheiljedang’s Integrated R&D Center.